NewsGator RSS tools had been since discontinued. I’ve been using M2 (mail and news client integrated in Opera ) for reading my feeds since I discovered RSS. I like tight integration and excellent search but it started to have performance and layout issues when number of feeds approached two hundred. So the search was made and new solution was found. Actually bunch of solutions because NewsGator offers whole family of RSS readers. pockets (Nokia E60, Nokia N810). Dragging OPML files around is hardly an option and few portable readers I tried (thinking about Dropbox syncing them) were sub-par. Also need to sync with my on-the-go setup called for online solution. Luckily I’ve remembered very inspired article about complete RSS solution at MakeUseOf and it turned out to be best of both online and software worlds. 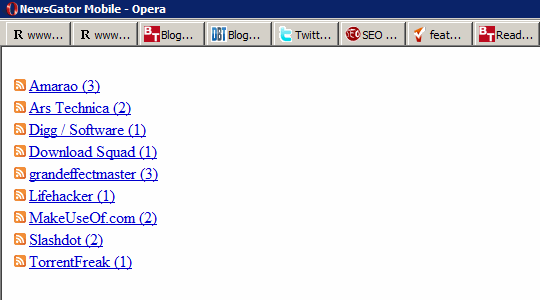 Strongest point of NewsGator is that it covers a lot of platforms. NewsGator for Yahoo Messenger . It simply works on everything. But amazing part is that all products in this set are tightly connected by free NewsGator account. Whenever feed item is marked read in any of NewsGator products – using Internet connection and account login that information in synced to account and to any other NewsGator service or application you are using . Same with list of feeds – no need to import/export OPML files ever again. Basically after initial setup I don’t have to deal with duplicate updates between my home, work and mobile. No matter where I read my feeds – changes are reflected everywhere. It also gives additional advantage to applications. Instead of downloading every single feed for update (like most newsreaders do) FeedDemon requests information about updates from server . It really cuts update time. I am obviously unable to cover every product but two I am using most are FeedDemon and Mobile. 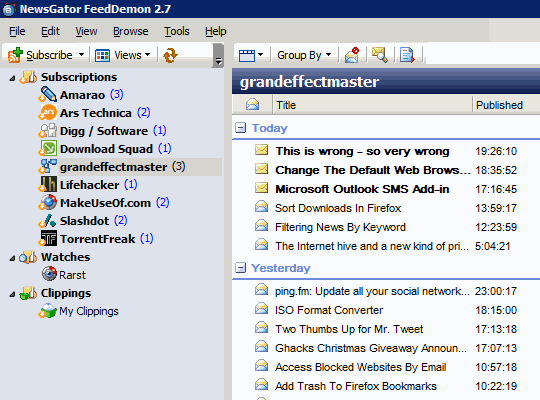 FeedDemon is desktop client for Windows. It has extensive interface with plenty of functions and too much buttons (they promise to simplify interface in upcoming update). I am sure I still hadn’t discovered and pressed plenty of buttons. Performance is excellent – both updates and actual reading process. Mobile is minimalistic version of online reader. If FeedDemon is simply good piece of software Mobile completely charmed me. It only shows feeds with unread items and only action is marking feed as read. It’s one of the best and most usable mobile-optimized sites I had ever seen. It’s pleasure to use both on desktop and on my Nokia N810. It uses no complex code and works excellent with mobile browsers. I’d use it even if it was single product stand-alone product but it’s synced to rest which makes awesome factor skyrocket. NewsGator RSS reader suite which I described in this post is a lot of awesome tools. But it’s simply scratching surface and company gives similar amount of attention to enterprise solutions, widgets and who knows what else – it’s huge. MakeUseOf review I mentioned was so positive some comments voiced suspicion if it’s paid. After using NewsGator for some time I can confidently say – it is THAT good. Wow, you certainly did your homework on this. I am an old fashioned Google reader fan. So far it meets all my needs but I will go check out the Newsgator stuff, especially on the mobile side. Thanks for the info. I am deeply incompatible with most of Google “online apps” services. :) They don’t feel right to me and desktop software that is capable of online sync will be better solution for a long time in my opinion. Just like 90% of the people, I have never used a reader, always via mail. Yep, email is way more common but RSS is easier to manage and makes (with good reader) easier to process a lot of updates in short time.